Go camping with a discount, together with your (grand)children! Going camping with the kids is a great way to spend the holidays. Playing games, sitting by the campfire or exploring the surroundings together with your children: a family campsite offers fun for parents and kids alike! Camping at a family campsite doesn’t have to be expensive. Via CampingCard ACSI you can have an affordable holiday: on more than 650 of the +3400 campsites you can bring up to 3 children (5 years old or younger) along for the same CampingCard ACSI rate, in other words: for free! This is also a good option if you are going camping with your grandchildren. 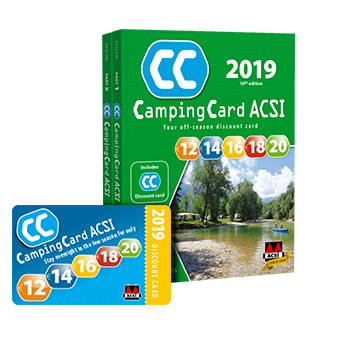 Apart from the financial benefit that going to a family campsite with CampingCard ACSI brings you, there are other advantages. Children’s campsites mostly take children into consideration. They often have special facilities* for children, such as children’s toilets, a paddling pool or a playground. Camping in itself is one big adventure for the little ones! They will find new friends quickly at a child friendly campsite. Whatever your preferences, you will always find a family campsite to suit your needs. There are many options for camping with the kids in the Netherlands, but other countries also offer many possibilities for child friendly camping. Italy and Germany have many family campsites. France, however, has the most options when you are looking for a nice family campsite: France has the most family campsite registered at CampingCard ACSI for affordable camping holidays with the kids! On the CampingCard ACSI website you can easily find a suitable child friendly campsite. Select the amenity `up to 3 children free` and choose your favourite country. The family campsites that offer a discount if you are camping with children are indicated in the search results. * Take note: not all the CCA children’s campsites are necessarily child-friendly. By the term ‘children’s campsite’ is meant a CampingCard ACSI campsite where 3 children (under 6 years) are included in the overnight rate.